Imagine economically vibrant urban areas where residents have a range of transportation options, safe, affordable housing choices and abundant green spaces, which are surrounded by robust rural communities where farmland is preserved and farmers make a viable living. . . Through a process called "Envision Oregon"* a few years ago, this is what Oregonians across the state agreed they wanted for Oregon's future. Please watch our video about planning for livability in the Rogue Valley! See our corresponding report, Envision the Rogue Valley, Creating a More Livable and Sustainable Rogue Valley through Responsible Land-Use Planning. click here. Thanks to a generous grant from Meyer Memorial Trust, Rogue Advocates has launched "Envision the Rogue Valley" to help make this vision a reality here in the Rogue Valley. Throughout 2011-2012, we worked with community members, city and county planners, transportation agencies and other local decisionmakers to create and then implement this vision in the Rogue Valley using "Smart Growth" tools. (Read more about "Smart Growth" here). Our ultimate goal is to create a Smart Growth Strategy for the Rogue Valley. Stay tuned to our page for updates on our work and our Smart Growth strategies and recommendations. 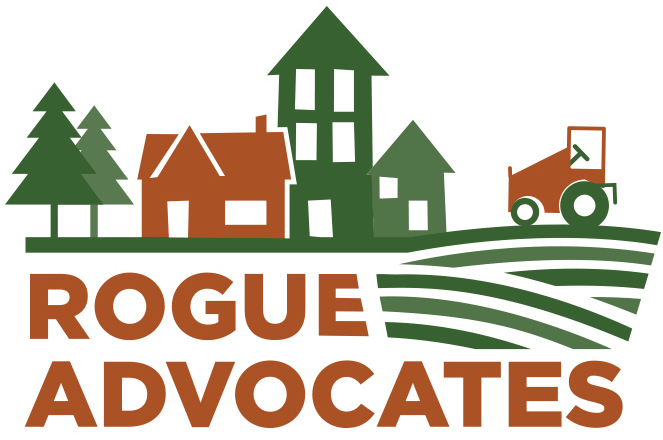 Rogue Advocates recognizes that endless growth threatens the preservation of farmland, forestland, open space, wildlife habitat, and livability that we treasure in the Rogue Valley.